As Henry Russell walked towards midfield after St. Frances Academy’s football team’s victory over Avalon School Friday evening, assistant coach Keith Kormanik grabbed Russell for a quick congratulatory hug. Defensive coordinator Stan White shook Russell’s hand before exchanging handshakes with their opponent. The more things change, the more they stay the same, of sorts as St. Frances won, 30-8, in Russell’s coaching debut at Martin Luther King Recreational Park in Montgomery County. Gary Brightwell rushed for 128 yards and a touchdown for the Panthers, and wide receiver Tyree Henry hauled in a pair of scores. 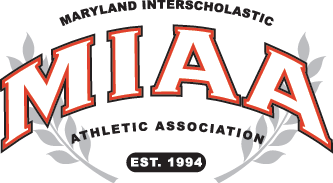 The east Baltimore school wore down Avalon in the second half, winning its first regular season opener since 2013, its inaugural voyage in the MIAA A Conference. Russell, a longtime assistant at Gilman School, is now at St. Frances with White and Kormanik and several other Greyhound assistants after coach Biff Poggi stepped down in January. Gilman won 13 MIAA A titles in Poggi’s 19 seasons. 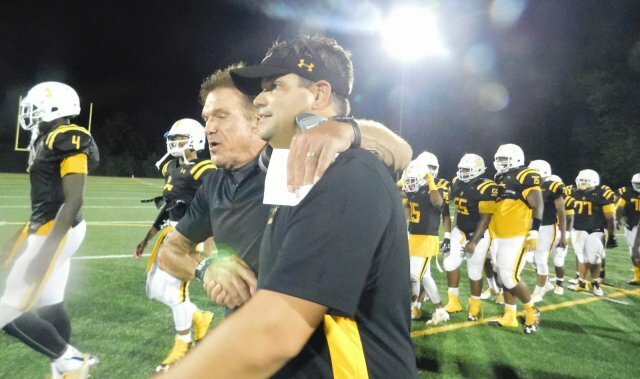 Russell, who was associate head coach under Poggi (now an advisor on the University of Michigan coaching staff), is St. Frances’ fourth coach in the program’s nine-year history. The last few months have been a whirlwind for Russell and his staff, establishing a culture on the field and the classroom. They had to mesh the holdovers with nearly two dozen transfers. The Panthers totaled 292 yards on offense with 194 on the ground. Junior Terrell Smith had a six-yard touchdown run, and senior quarterback Isaiah Robinson (10-of-21, 98 yards) threw two scores. Defensively, St. Frances held Avalon to 84 yards, mostly coming on a tipped 49-yard touchdown pass. Eyabi Anoma and Sam Thomas each recorded an interception and senior Tariq Coley had a sack. The Panthers allowed just 16 yards in the second half. After teammate Jordan Swann knocked down the ball on a backward pass on the opening play from scrimmage, Thomas intercepted Avalon quarterback Quan Vines at Avalon’s 35-yard line. Seven plays later, Henry pulled down a Robinson throw in the back of end zone for the Panthers’ first score of 2016. Avalon, which beat St. Frances at Patterson Park in the 2015 opener, tied the game at 8 late in the first quarter as Reggie Anderson caught a ball that went off Smith’s hands in the end zone for a 49-yard score. Henry acquired the lead for good for St. Frances, taking advantage of blown coverage for a 50-yard score with 15 seconds left before halftime. Henry, a 6-foot-5 junior transfer from Stephen Decatur, thinks St. Frances has a high ceiling. Brightwell, a Temple commit who transferred from Delaware’s St. George’s Tech, powered his way for 73 of his 128 yards in the second half. He capped a seven-play, 57-yard drive with a 1-yard run, extending St. Frances’ advantage to 22-8. Brightwell commended his offensive front featuring Darrien Dalcourt (6-foot-4, 280 pounds), Joshua Miller (6-2, 285), Ben Amadi (6-3, 285), James Goodwin (6-3, 300) and Antonio Derry (6-3, 300). “Everyday is hard work,” said Brightwell, who toted the ball 28 times and caught three passes for 8 yards. Russell said it’s been “on the go” since arriving at St. Frances in February. He will take a rare off day Saturday, playing in a charity golf event in honor of his former Naval Academy classmate Brendan Looney. The Panthers next assignment figures to be much tougher – a nationally televised match (ESPNU) with New Jersey powerhouse Paramus Catholic at the University of Michigan next Friday night.